The man who seemed the simplest and purest of baseball's stars was always the most complicated. This story appears in the July 4–11 edition of Sports Illustrated. Subscribe to the magazine here. On May 31, 2010, Twins closer Jon Rauch threw a 91-mph fastball to the lefthanded pinch hitter the Mariners had brought on to try to erase a one-run deficit in the bottom of the ninth. The batter’s swing still had the qualities that made it the most famous, and most beautiful, since Ted Williams’s: the easy torque; the perfect arc; the low, one-handed follow-through. The ball, though, bounced meekly to the second baseman. Nobody knew it right away, but they would never see Ken Griffey Jr. swing again. He didn’t play the next day, which was no longer unusual. At 40 he was batting .184, and he still had the same number of career home runs with which he had finished 2009, 630, at the time the fifth most ever. After that night’s game he hugged one teammate, backup catcher Rob Johnson, and packed up his place. At 5 a.m. he got into his Infiniti QX56 and pointed it southeast. Jay Buhner, the brawny outfielder, had become Griffey’s unlikely best friend—his “bald-headed brother from another mother,” as Griffey called him—during their 11 years together in Seattle. Buhner had retired nine years earlier. Late that afternoon he received a curious call from another friend. “Dude, I’m here at a gas station on Interstate 90 in Montana, and I swear to God that Ken Griffey Jr. is filling up right next to me,” the friend said. Buhner called Griffey. “Dude,” Buhner said, “where the f--- are you?” Griffey told him. Griffey wasn’t angry or distraught, but he couldn’t stomach the idea that his mere presence on the team with which he had spent his first and best years, and to which he had returned after a decade away, might force it to give him distracting at bats. Not when his three children—especially 16-year-old Trey, who was approaching manhood—needed him home. Griffey drove for 43 hours, consuming only two Mountain Dews. He spoke with the people who meant the most to him. His mother, Birdie. His younger brother, Craig. His friend Torii Hunter. He spoke with his dad, Ken Sr., three times; Griffey long ago assigned him a special ring tone, of a heavily aspirating Darth Vader revealing, “I am your father.” Other than that, he covered those 3,000 miles, across I-90 before weaving through the heartland to I-75, in silence. When Griffey finally stepped out of the car, in the early morning of June 3, in the driveway of the six-bedroom Orlando-area mansion inside of which his family slept, he was at peace. It was as if he had emerged from 43 hours in a decompression chamber. On Sunday, July 24, Griffey will be inducted into baseball’s Hall of Fame, after having been named on a record 99.3% of ballots, all but three of the 440 cast. He will have already lived, often uneasily, in fame’s prism for nearly three decades. We feel as if we’ve known him since he was 19, when he came to us with astonishing gifts and a wide grin on a baseball card. As it turns out, the man who seemed the simplest and purest of stars was always the most complicated. At home in Florida, Griffey takes pride in the contents of his 10-car garage. It’s late in the morning one day in early March, nearly six years after he drove away from baseball and 4 1/2 months before Cooperstown. Walter Iooss Jr., the Griffey of sports photographers, has arrived at his house to shoot his portrait. The two go way back. In 1997 they collaborated on a coffee-table book, Junior: Griffey on Griffey, and Griffey respects Iooss’s art. In retirement he has pursued photography himself, with a collection of gear Iooss deems better than his. Still, setting up the shot takes some persuasion on Iooss’s part. 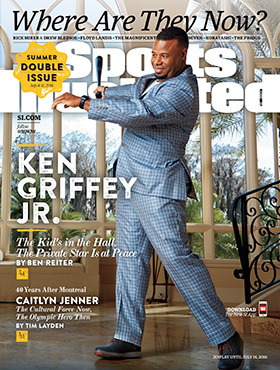 Griffey, no longer as lithe as he once was, claims not to own a suit (“A what? A who?”) before producing one, from a closet otherwise full of Nike golf shirts in every conceivable color. He says that he does not have a bat (“Why would I have one of those?”) but finds one. He genuinely doesn’t own a hat. “I got visors,” he says. “I got more visors than the Old Ball Coach,” referring to Steve Spurrier, the former headman at Florida and South Carolina. Finally besuited, and with stick in hand, Griffey stands where Iooss has directed him, in the center of his house’s grand entrance hall. He’s perfectly positioned in front of a wall of windows, through which one can see his pool, with its exactingly engineered rock formations, and a grove of palm trees. Iooss’s finger hovers above his shutter button. There is just one problem. Ken Griffey Jr. won’t swing. Every man’s house is his domain, his refuge. Griffey zealously subscribes to that concept. A visitor who has been permitted through its remote-controlled front gates will encounter 250 pounds of square-headed dog, two adult Cane Corsos and a Rottweiler puppy. “One of my dogs, Flo? She don’t like a whole lot of people,” says Griffey. The property is bordered by a seven-foot wall on three sides, and on its fourth by a lake that is home to alligators that grow up to 12 feet. Griffey, who changes his cellphone number as many as five times a year, built the house a decade ago, but he doesn’t know any of his neighbors. “What am I gonna do, borrow some sugar?” he asks. Griffey keeps baseball hours, staying up watching reruns of crime shows on the Ion cable network until its schedule ends at 3 a.m. “Sometimes I’m like, Wow, Criminal Minds is deep,” he says. His house has a 10-car garage, and he spends a lot of time with its customized occupants, which would impress anyone who knows about cars and has gotten past the dogs. He’s got a Range Rover, a Mercedes, a Ford F-150 Raptor truck, a chromed-out motorcycle and the same model of Porsche, he says without evident concern, as the one in which actor Paul Walker died. In the back of his driveway, too large for the garage, is a 45-foot Featherlite luxury coach that he has named the Rolling Projects. He is particularly fond of his Rolls-Royce Wraith, which costs $304,350 at its most basic, which Griffey’s isn’t. It is the second Wraith he has owned. “I bought one, and Trey gave me a hard time about it because he saw on TV that they killed, like, 15 bulls to make the interior,” he says. “I just got rid of the car ’cause I didn’t want to hear about it. But I liked the car. So I bought another.” He presses a button on the car’s door frame. “Anyone need an ­umbrella?” he says, pulling one out of a secret compartment, his eyes shining with delight. 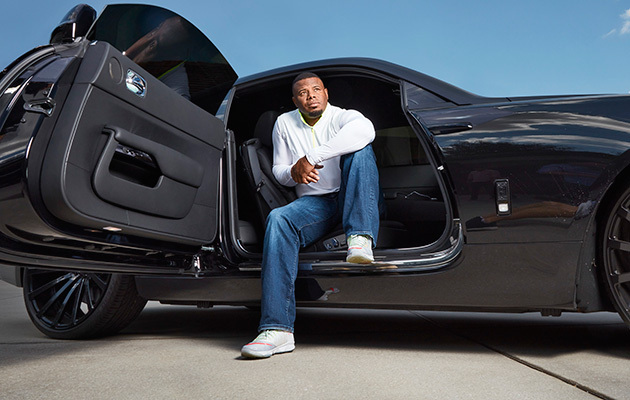 The windows of each of Griffey’s vehicles are tinted a glossy, impenetrable black. Griffey is aware of his enduring image. To most, he’s still the Kid, carefree and ever young. “A couple things I’m gonna be remembered for: the hat backwards and the swing,” he says. “And the smile.” Underneath it all, though, there was more going on than he wanted anyone to realize. He always had that sweet stroke, but for a long time he couldn’t do anything with it when one man was watching. By 1987, when he was a 17-year-old high school senior, Junior was all but ­assured of being the draft’s top pick. Senior had been traded to the Braves, and one afternoon before a road game in Cincinnati he accompanied Bobby Cox, then Atlanta’s GM, to watch his son play. Junior whiffed during his first two at bats. Around 3 p.m., Senior had to leave for River­front Stadium. Later that night he returned home. “How’d you do?” Senior asked. “I did O.K.,” Junior said. Junior debuted for the Mariners 15 months later, and by then he had developed coping mechanisms to deal with the masses of people who were drawn to him. “For me it was, Why does everybody want me?” he says. “I just want to play baseball.” He became known as the Natural, not only because of his skills but also because he claimed never to know the names of anyone he played against, even Cal Ripken Jr. That wasn’t true. He met his wife, Melissa, during his rookie year in Seattle. She didn’t know who he was at first, but quickly learned the best way to end an argument with him. Once, early on, he upset her in a shopping mall in Bellevue, Wash. “I’m with Ken Griffey Junior!” Melissa shouted. Every child in the mall came running after him. Melissa never did that again. 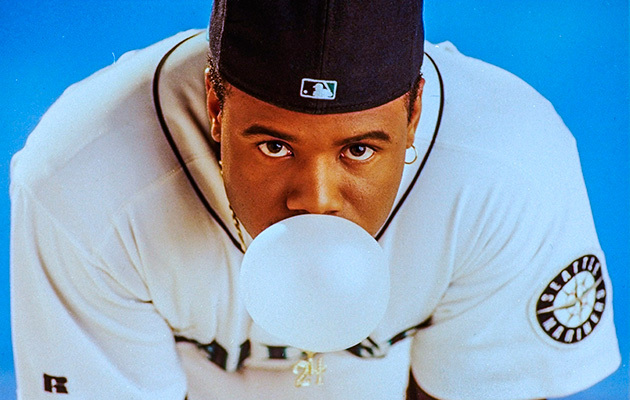 Mimicked by millions, Griffey’s backwards hat became a central part of his image as a player. Their daughter, Taryn, was born the following October, but the Griffeys wouldn’t make a third addition to their family for seven more years. Melissa had been adopted, and she always wanted to give to a child what her parents had given her. She never called her husband at the ballpark, but on one early May afternoon in 2002 she did. “There was a baby born today, here in Florida,” she said. “I want this one.” She brought him home, and she and Junior scrambled to come up with a name for him. They decided on Tevin. Griffey didn’t meet his new son until a week later, when he flew home during an off day and signed the paperwork. 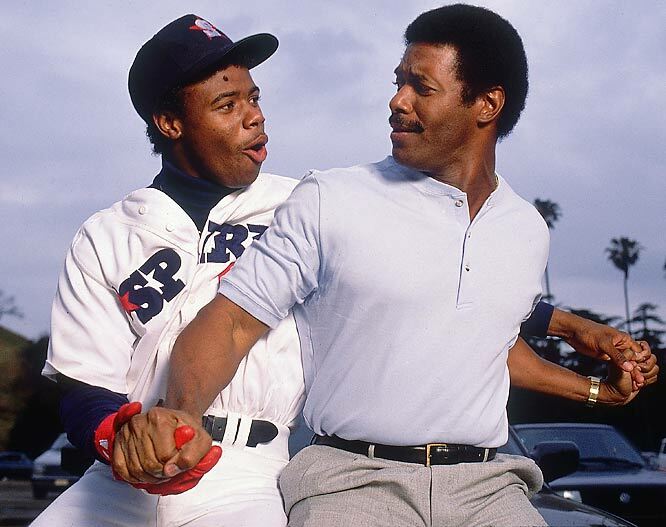 As it had for his father, Griffey’s job kept him away from his family for most of the year, but he had access to two things that his dad didn’t: modern technology and an enormous amount of money. 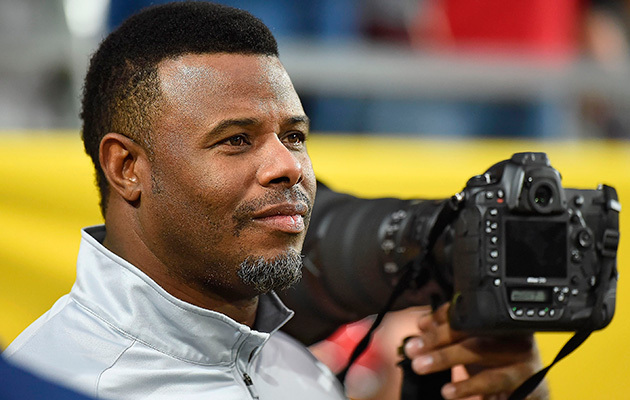 As Trey and Taryn gravitated to sports other than baseball—football and basketball, respectively—Griffey hired a videographer to record every one of their games, and he watched them in the clubhouse before his own. While many view the trade he helped engineer from Seattle to Cincinnati before the 2000 season as a mistake, and a neat demarcation of the beginning of his decline, he never regretted it. It allowed him to spend spring training at home in Florida, affording him an extra month and a half a year with his family. “I got to see them grow,” he says. “They got to see me.” Cincinnati’s relative proximity to Orlando—and a private plane—also enabled him to attend his kids’ games in person, even during the season. Trey is now a 6' 3" wide receiver at the University of Arizona, and Taryn is a point guard there. Griffey often shoots their games with the rest of the sideline shutter­bugs. His love of photography is genuine, but it is also strategic, in that it allows him to watch his kids in peace. “Would you tap somebody on the shoulder if they’re like this?” he says, as he pantomimes raising a camera to his eye. Not long after he arrived home from Seattle, in 2010, he was on the road again, behind the wheel of the Rolling Projects, his 45-foot luxury coach, as Taryn’s AAU season had begun. He drove it to Chicago; Sewanee, Tenn.; Atlanta; Augusta; back to Atlanta; and to New Orleans. The bus’ name is ironic. He started calling it that after he registered the looks he’d receive when people, not recognizing him in his sunglasses and golf shirts, saw a black man stepping out of such a vehicle. They would ask him if the bus’ owner would let them have a look inside. He was the owner, he said, and no, they couldn’t. Griffey never cared if his kids won or lost, as long as they tried, but when he isn’t photographing their games, he forces himself to watch with a stony stillness. “I’ve got friends who have kids, and they go to games and cheer, but I sit with my arms folded,” he says. “I can’t allow people to see me excited because they’ll be like, Oh, there he goes, he only cheers for his kids. And if they think I’m a d---, who do they take it out on? My kids. They can’t take it out on me. But they can take it out on them.” When you’ve got fame like Griffey’s, it trickles down through the generations, for better and for worse. By attending his son Trey’s games at Arizona as a member of the media, Griffey can watch in relative peace. Marriage can be a tricky institution for pro athletes, especially after the cheering stops and one sort of life becomes another. 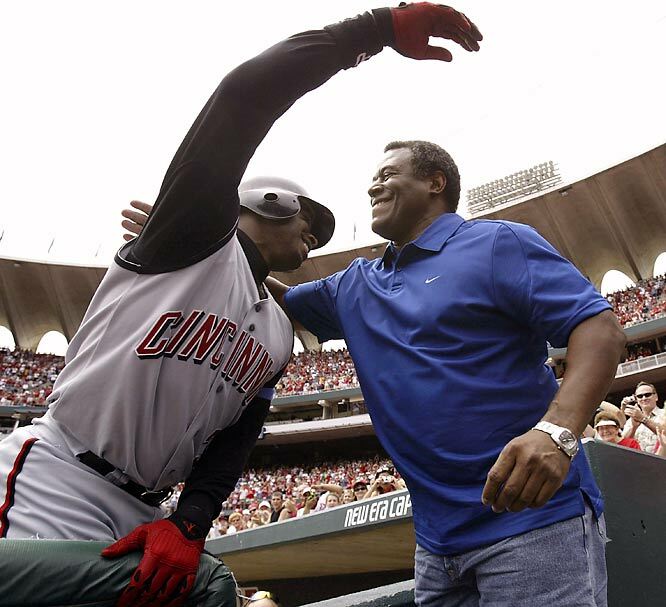 Griffey’s parents divorced in 1999, eight years after his father retired. This October, though, Griffey and Melissa will celebrate their 24th wedding anniversary. Griffey’s days, now, are guided by two principles. First he does what his family needs. The rest of the time he does only and exactly what he wants to do. That keeps him busy. “My friends always say, Damn, you don’t let no grass grow beneath your feet,” he says. He flies planes, as a licensed pilot and the owner of a Cirrus. He plays golf—a lot of golf. He had recently returned from a four-day, 121-hole trip to Bandon Dunes, in Oregon. He’s yet to play Augusta, but not because of its exclusivity. “I can get there,” he says. “I just ain’t had a chance to go.” He is cagey about his handicap. “I’m a 13,” he says. “Am I a 13? No. But I want you to write that.” Later, he admits, “I’m a three. But when you write this, it’s gotta be a 13.” The USGA indicates that he is a three. Now he flies around the country to appear with his father in support of prostate-cancer awareness, as part of the Men Who Speak Up campaign, which is sponsored by the pharmaceutical giant Bayer. Cancer has hit Griffey’s family hard, and it is one part of his life that remains out of his control. Four of his father’s uncles died of prostate cancer, and on consecutive days in July 2006, Griffey learned not only that his father had developed the family disease but also that his mother had been diagnosed with colon cancer. 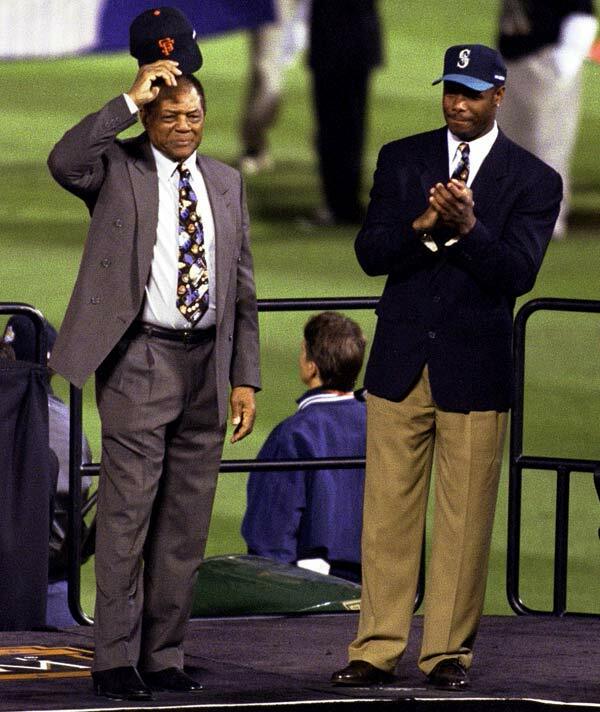 Heartbroken and scared, Griffey batted .191 that month, but he expected little sympathy. “People think we’re super­heroes, invincible, supposed to not feel anything,” he says. “People think we’re not supposed to have problems. ‘If I had his money, I wouldn’t have a care in the world.’ Well, people get sick, people die, and that’s way more important than the sport.” Both of Griffey’s parents are currently cancer-free. Griffey’s house is filled with family photographs, but his collection of personal memorabilia is curated and confined to one room, his private study. Here he keeps such treasures as his 1997 AL MVP plaque, his Jackie Robinson autograph and a photo signed by the Predator. “Kevin Peter Hall!” he says, as if the thespian who portrayed the oversized extraterrestrial manhunter has a name as recognizable as his own. The study also contains Griffey’s 10 Gold Gloves. On the second of them, earned in 1991, his last name is spelled GRIFFY. Rawlings sent him a replacement, with the proper engraving, but he insists on displaying this one. They didn’t happen to many of his contemporaries. Barry Bonds was for a time his doppel­gänger, another son of a big leaguer who could do everything there was to do on a diamond. If there is one man whom Griffey might resent, it’s Bonds, who chemically surged past Hank Aaron’s home run record as Griffey’s own pursuit was slowing. But Griffey feels as if Bonds should join him in Cooperstown. “Was he a Hall of Famer when he played in Pittsburgh?” he asks rhetorically. Griffey Jr. had to grapple with following in the footsteps of his three-time All-Star father of the same name, but it wasn't long before the younger Griffey made a name for himself, starting with being the No. 1 pick in the 1987 draft. Ken Jr. reaches the majors in 1989 while his father's career is winding down in Cincinnati, making them the first father-son duo to play in the big leagues at the same time. That August, Ken Sr. joins his son on the Mariners and in September, the Griffeys hit back to back home runs off California Angel Kirk McCaskill. 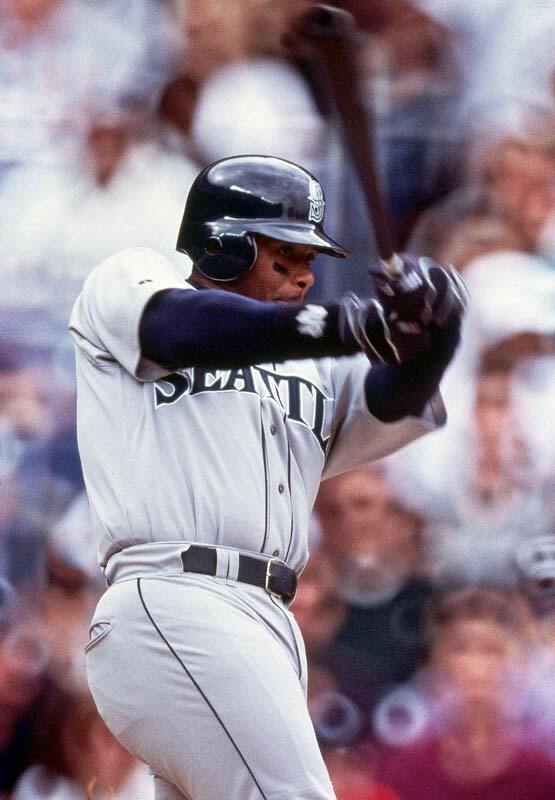 While his father was mostly a singles and doubles hitter, Griffey Jr. is a power hitter from almost the moment he sets foot in Seattle. In 1993, he wins the Home Run Derby at the All-Star Game in Baltimore, and becomes the only person ever to hit a ball off the warehouse beyond the right field fence. Griffey quickly became one of the best defensive players in the game, winning 10 consecutive AL Gold Glove awards from 1990 to '99. 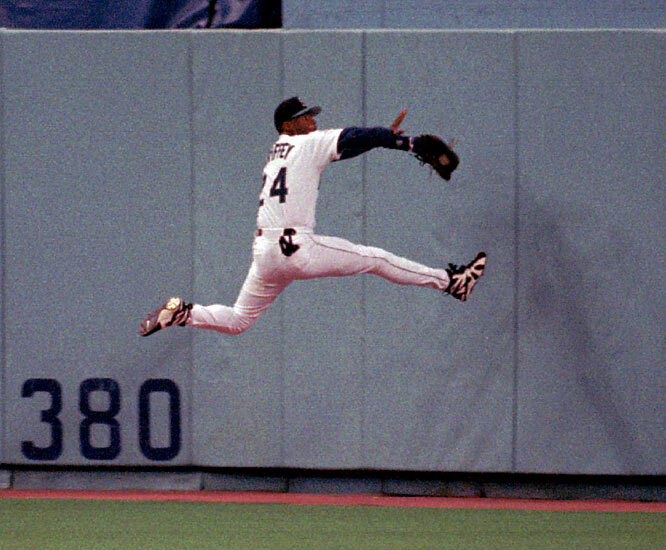 On this catch in May 1995, Griffey broke his wrist and missed 73 games. 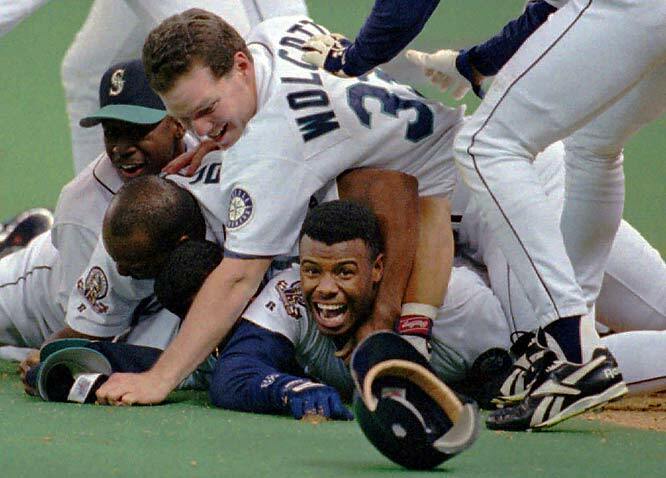 In 1995, the Mariners looked like they may be headed out of Seattle, until an electrifying playoff run, keyed by Griffey, helped land them approval for a new ballpark. In the division series against the Yankees, Griffey hit five home runs and scored the series-winning run in the 12th-inning of the do-or-die Game 5. He was mobbed by his delirious teammates. 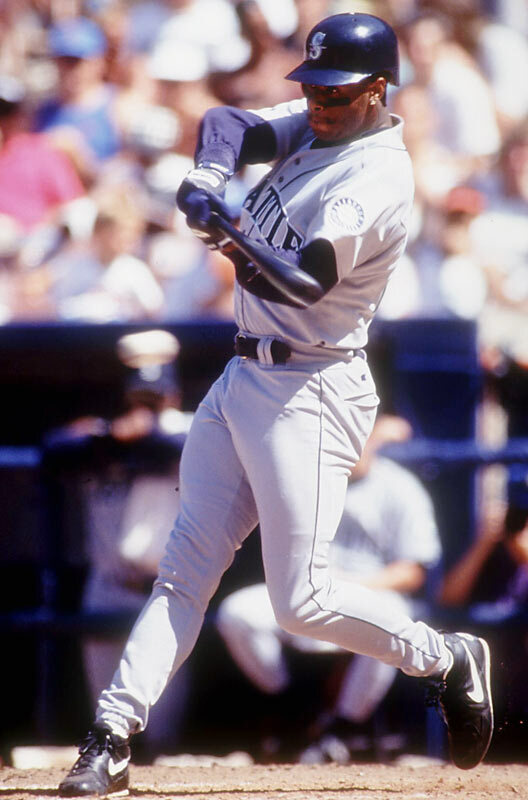 In 1997, Griffey won his only MVP award to date with a monster season: .304 average, 56 HRs, 147 RBI, .646 slugging for the AL West champion Mariners. In 1999, still in the prime of his career, Griffey was voted to major league baseball's 30-man All-Century Team along with Willie Mays, another fun-loving star who was as talented in the field as he was at the plate. 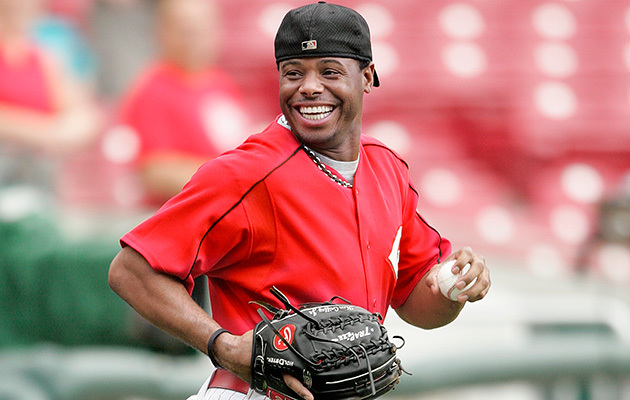 After the 1999 season, Griffey asked to be traded back to his hometown Cincinnati Reds. 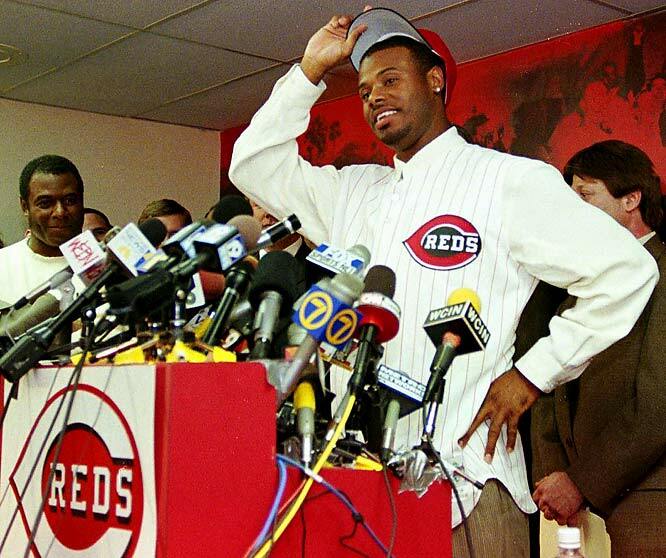 The Reds acquired Griffey for four players, but the trade did not have the desired effect for Griffey or the Reds. While Seattle made the playoffs the next two years, Griffey has suffered through numerous injuries and the Reds have not reached the postseason since his arrival. 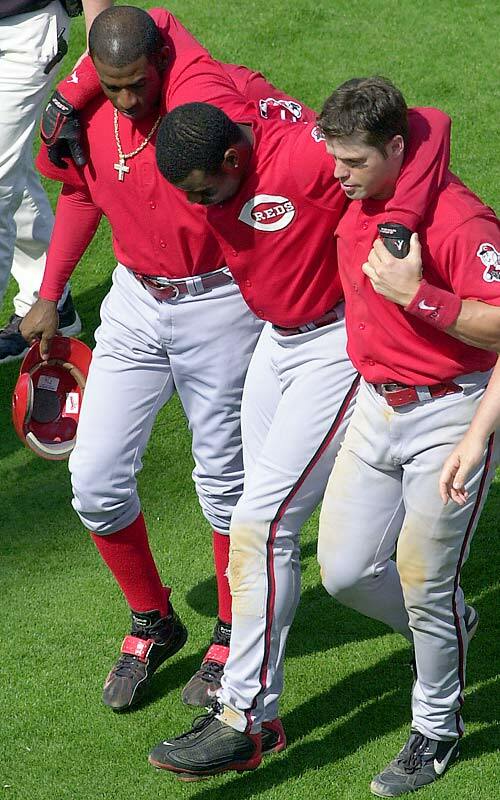 After playing 145 games in his debut season in Cincinnati in 2000, Griffey was felled by a string of injuries to his hamstrings, knees, ankles and shoulder. Over the next six seasons, he made eight appearances on the disabled list and never played more than 128 games in a season. Griffey opened the 2004 season healthy. On Father's Day that June, he reached the 500 Home Run club with a blast off the Cardinals in St. Louis, and later shared a hug with his dad. 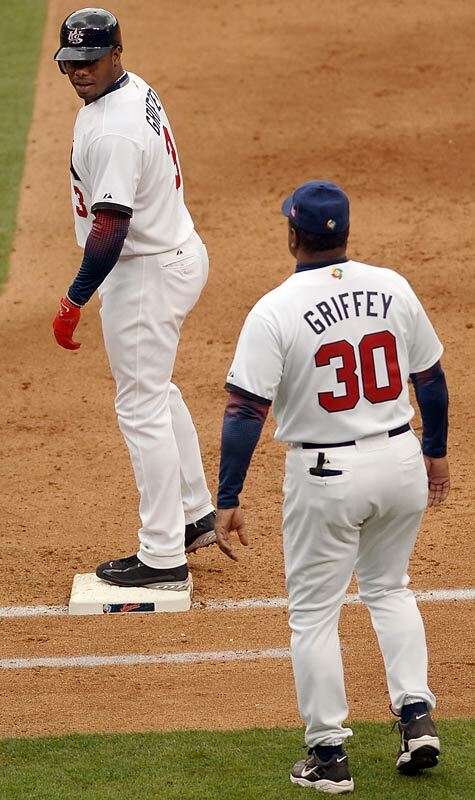 In 2006, Griffey played for Team USA, and his father joined him as a coach, at the inaugural World Baseball Classic. While Griffey starred, batting .524 and being named to the All-WBC team, the U.S. was a huge disappointment, failing to reach the semifinals. It took seven years, but Griffey finally returned to Seattle in June 2007 for his first games in the Emerald City since being traded away. 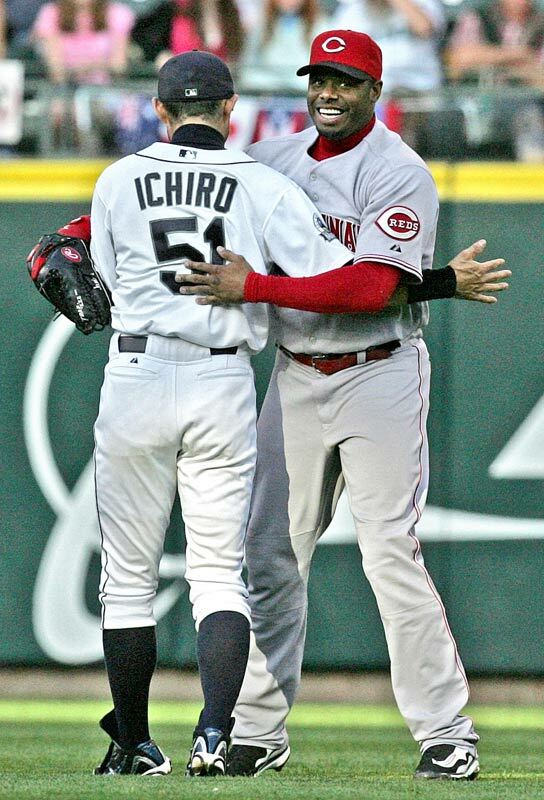 Ichiro was the new star in town, but Griffey earned plenty of cheers, especially after hitting a pair of home runs in the series finale. 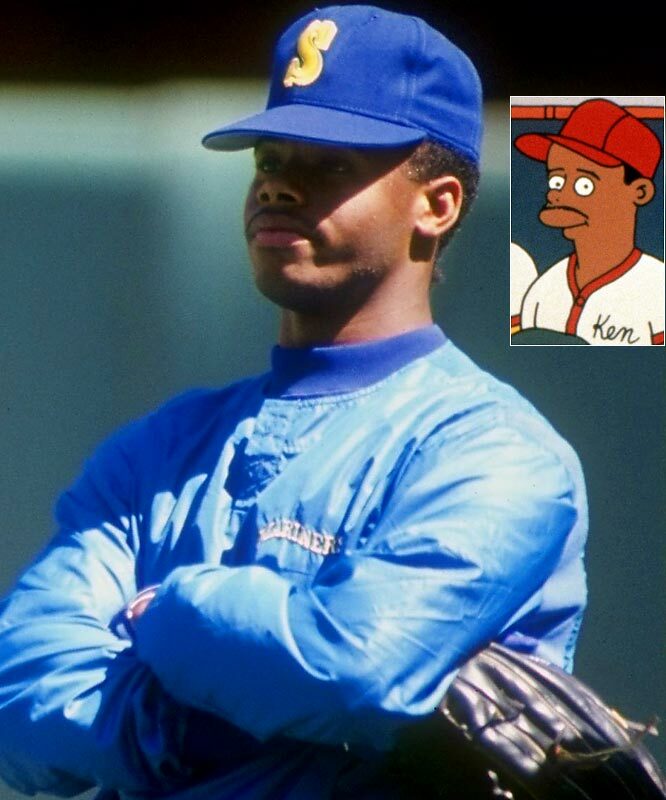 Griffey is well on his way to Cooperstown, but he's already in the Hall of Fame of best guest appearances on The Simpsons. Playing himself in a 1992 episode "Homer at the Bat," Griffey becomes a ringer on the company softball team (along with other stars like Wade Boggs, Ozzie Smith and Darryl Strawberry), but an extreme case of gigantism knocks him out of the big game. He also misses the high jinks. “That’s the last guy you wanna f--- with in the clubhouse, try to pull a prank on,” says Buhner. Griffey loved to make little bets with Lou Piniella, his manager in Seattle starting in 1993, such as whether he could hit a home run to right, center and left on three straight batting practice swings. The prize was always a steak dinner. During spring training of ’95, Griffey was on a losing streak. One day he had an idea as to how he’d pay his mounting debt. “I got this guy, a farmer up the road,” he told his teammates. “I need you to distract Lou.” When Piniella finally returned to his office, he found that Griffey had delivered his steak dinners in their original form, that of a 1,200-pound cow. “Aw, s---, Junior!” Piniella shouted, due not as much to the animal’s presence but to what it had done. “The damn thing had s--- all over,” says Buhner. When the Mariners inducted Griffey into their Hall of Fame, in August 2013, he spoke of Buhner last. “There is no other person in this world, other than my parents, that if something ever happened to me or my wife, that I would want to raise my kids,” Griffey said. Buhner dabbed his tears with his necktie and gave Griffey the finger. 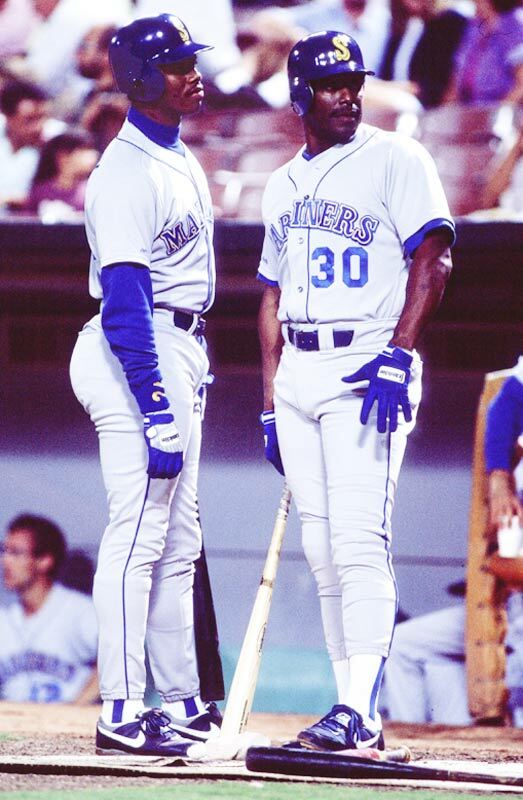 When Griffey and Buhner played together, they would pause at either first or third base on their way to the outfield—whichever was closer to their dugout—and dap, touching gloves and performing a routine with their spikes. After his trade to Cincinnati, Griffey kept up the bit, at first with a phantom partner. A few weeks later Barry Larkin asked him what he was doing. From then on he did it with Larkin. Griffey has watched some of his former oppo­nents, like Bonds and Mark McGwire, return to baseball as full-time hitting coaches. He has difficulty imagining that he’ll follow them. He spends a lot of time traveling to Arizona to his older children’s games, and Tevin, a star youth quarterback, is only 14. “Then I’ll want to go to his college games,” Griffey says. He could conceivably take a job in baseball after that, but that would be nine years from now, when he is 55. “But hopefully Trey gets to play on Sundays, and Tevin, too, and hopefully my daughter can play in the WNBA and overseas,” he says. “If not, then watching them become responsible adults within the community is just as important.” A return doesn’t appear likely. Finally Griffey swung. It was half-speed, but it was beautiful. Iooss’s shutter hungrily snapped. “One hell of a swing!” Iooss shouted. It always was.